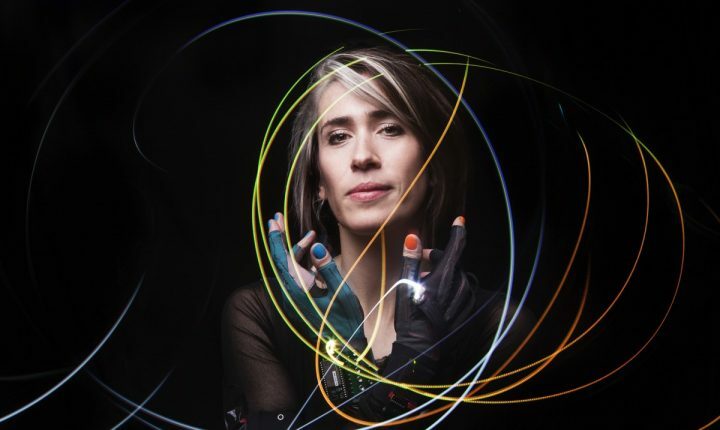 Self-produced, independent, engaged, Imogen Heap blurs the boundaries between pure art form and creative entrepreneurship. Writing and producing 4 solo albums, Heap has developed a strong collaboration with her loyal following both on- and offline in recognised, pioneering ways. Her graceful tunes such as her signature track „Hide & Seek“ populate movies and TV shows, accompany dance and theatre performances. As a respected ‘artist’s artist’, Heap has cowritten songs with Taylor Swift, Mika, Josh Groban and Deadmau5 among others. Heap’s been nominated for 5 Grammys, winning one for engineering and another for her contribution on Taylor Swift’s album „1989“. Her collection of awards decorating her self-built home studio also includes an Ivor Novello award, The Artist and Manager Pioneer award and an honorary Doctorate of Technology. Her studio and stage work, along with a team of engineers, has attracted worldwide attention from artists to Universities and within the press for humanising music tech in performance. Becoming a mother in 2014, combined with being free of labels and management for the first time in her 20 year career, she released her song „Tiny Human“, as an experiment for her newly founded music collective and collaboration community „Mycelia“: her vision for a sustainable music industry ecosystem. Wishing to explore potentials for new business models in the light of distributed ledger technology and smart contracts, Heap released the song completely with a rich set of metadata to empower services to think differently and invite them to collaborate with her for further development of their services. From her first thoughts in Forbes to appearing at the WEF, Davos this year, Mycelia continues to inspire. Imogen has also written the entire score for Harry Potter and the Cursed Child which has set new standards in Theatre.